Cracking in deaerators is most often attributed to corrosion fatigue, where a crack results from a cyclic stress (i.e. vibration and pressure fluctuations) in a corrosive environment. Cracks in deaerators are normally not detectable with the naked eye. For this reason, wet fluorescent magnetic particle examination of all internal pressure welds is recommended periodically. Cracking can occur in the deaerator or the storage tank, and often initiates in a pressure weld or the associated heat-affected zone. 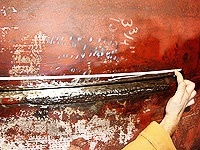 When detected, cracks are normally ground out and repaired by qualified welders.